The facts of the case were that the landlord opposed the tenant’s application for a new commercial lease, claiming that it intended to carry out works to redevelop the property. What was unusual in the case in point was that the landlord’s intention was to carry out the works in order to obtain occupation of the property…the works in and of themselves were commercially not very attractive. The landlord conceded that if the tenant left voluntarily, none of the works specified would be carried out. In the County Court it was accepted that, although the whole purpose of the scheme was to terminate the tenant’s lease, the fact that the landlord intended to carry out the work was sufficient reason for the application to succeed. That decision was overturned by the Supreme Court (the appeal having leap-frogged the Court of Appeal). The Court concluded that the landlord’s intention to carry out the redevelopment must exist independently of the tenant’s wish to have a new tenancy. 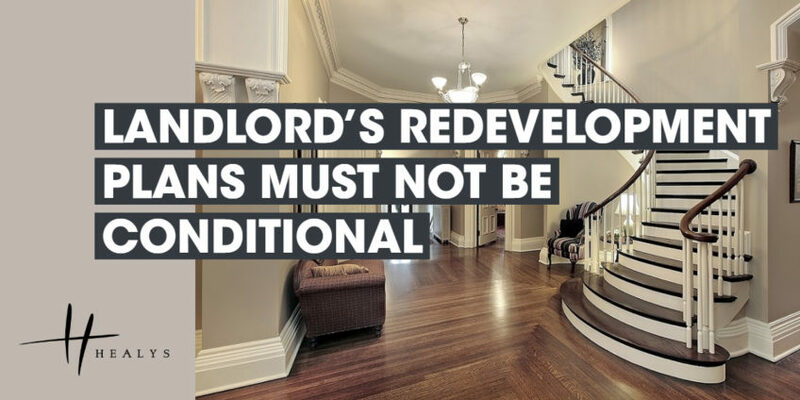 If the works would not be carried out if the tenant left voluntarily, the landlord’s intention was clearly conditional and could not provide grounds for a successful opposition to the tenancy.